﻿Texas beargrass is toxic to livestock and useful for weaving. ﻿Large mounds of evergreen Texas beargrass stand out against the dry, brushy landscapes that surround the Texas AgriLife Research Station south of Sonora. Texas beargrass — also called bunchgrass and Texas sacahuista — occurs in rocky soils across the state’s southwestern quadrant. Its leathery leaves, 3 to 4 feet long, spill like fountain grass from a woody base. The leaves are either smooth or have a few widely spaced, tiny, sharp teeth on the margin. Despite its name, the perennial species is not a grass but more of a shrub. From there, further description can flip-flop. 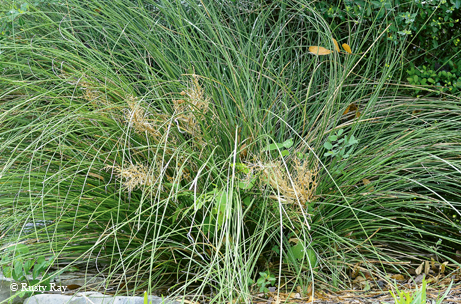 Some botanists place beargrass in the agave family with yuccas and century plants. Others list the plant as part of Liliaceae (lily family). In spring or early summer, beargrass blooms for three weeks. The creamy-colored clusters barely rise above leaves, if at all. The species is a nectar and larval host plant for sandia hairstreaks (Callophrys mcfarlandi). Larvae dine on both flowers and fruits. Factoid: Native Americans used beargrass leaves to weave sturdy baskets and mats.